Huygens Probe Descent - Solar System Planets And Moons Section. Planned Descent Path for Huygens. NASA and the European Space Agency. Engineers at NASA and the European Space Agency have calculated Huygen's descent through Titan's atmosphere tomorrow, and they think they know where it'll land. 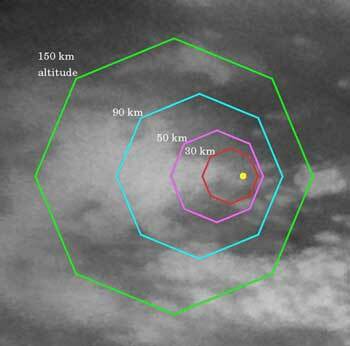 The probe will fall by parachute for about 2 hours from an altitude of 160 km (99 miles) until it reaches the surface. During this descent, it will be taking pictures and measuring the atmosphere with five science instruments. All these data will be sent to Cassini, and then relayed back to Earth. Controllers are hoping that Cassini will get a chance to take a panoramic picture of Titan's surface as it descends, slowly spinning, to help explain the strange formations uncovered by Cassini on an earlier flyby. This map illustrates the planned imaging coverage for the Descent Imager/Spectral Radiometer, onboard the European Space Agency's Huygens probe during the probe's descent toward Titan's surface on Jan. 14, 2005. The Descent Imager/Spectral Radiometer is one of two NASA instruments on the probe. The colored lines delineate regions that will be imaged at different resolutions as the probe descends. On each map, the site where Huygens is predicted to land is marked with a yellow dot. This area is in a boundary between dark and bright regions. This map was made from the images taken by the Cassini spacecraft cameras on Oct. 26, 2004, at image scales of 4 to 6 kilometers (2.5 to 3.7 miles) per pixel. The images were obtained using a narrow band filter centered at 938 nanometers - a near-infrared wavelength (invisible to the human eye) at which light can penetrate Titan's atmosphere to reach the surface and return through the atmosphere to be detected by the camera. The images have been processed to enhance surface details. Only brightness variations on Titan's surface are seen; the illumination is such that there is no shading due to topographic variations. For about two hours, the probe will fall by parachute from an altitude of 160 kilometers (99 miles) to Titan's surface. During the descent the camera on the probe and five other science instruments will send data about the moon's atmosphere and surface back to the Cassini spacecraft for relay to Earth. The Descent Imager/Spectral Radiometer will take pictures as the probe slowly spins, and some these will be made into panoramic views of Titan's surface. This map (PIA06172) shows the expected coverage by the Descent Imager/Spectral Radiometer side-looking imager and two downward-looking imagers - one providing medium-resolution and the other high-resolution coverage. The planned coverage by the medium- and high-resolution imagers is the subject of the second map (PIA06173). The Cassini-Huygens mission is a cooperative project of NASA, the European Space Agency and the Italian Space Agency. The Jet Propulsion Laboratory, a division of the California Institute of Technology in Pasadena, manages the Cassini-Huygens mission for NASA's Science Mission Directorate, Washington, D.C. The Cassini orbiter and its two onboard cameras were designed, developed and assembled at JPL. The imaging team is based at the Space Science Institute, Boulder, Colo. The Descent Imager/Spectral team is based at the University of Arizona, Tucson, Ariz.